Underwater Mortgages – What’s the “Right Thing” to Do? Great Article! Heres my argument. What if you take out a mortgage on a home that costs you $800,000, then two years down the road the same home is worth $600,000. You default on your loan and loose the home. Then another 3-4 years later then same home is now worth $900,000 and eventually more. I understand the fear in selling but you never know. Underwater…what rate are you paying? What type of mortgage did you get to buy this place? 1 yr adjustable. Yes, I am pure evil. So here’s the thing I had a 5 yr adjustable in boken with the intent to refinance or sell after year 5. I am in year 7 but have not sold or refinanced. Why, because my adjustable is 2.25% until september of this year. I intend to sell this spring. And according to you folks make so much money I should never be allowed to make money again! Daytona is also low at the moment. 5.25% and being the responsible person I am (believe it or not) I’ve already tried to refinance. Which I was rejected because I am underwater. So, once again my point is, they are pushing people (not just me) to ruin their credit and get out because in a year from now my rate may be 8.5% and I will be even further in debt because of the banks refusal to work with me. I’m enjoying the fact that folks here are bitter and we should all have 0 net worth. Sadly I am being responsible and trying to optimize the situation. So rather than attacking me for having a few places, perhaps you should understand I am seeking advice. Or is that people who are able to survive in this economy should not seek advice and just keep their mouths shut and move along. Advice board this is not… but now that I see you are all just angry folks that think one person has cause the housing mess, I am enjoying the comments. Underwater – I guess I don’t understand your point. 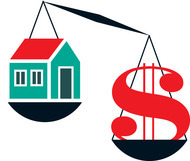 You are askig the bank to adjust your rate, because your home is worth less than what you paid? The bank has no reason to do that. You state you can easily afford the monthly payments, but yet you want the bank to lower your rate so you can save money. Why should the bank renegotiate a profitable loan, just because you want them to? By that token, would you allow a bank to raise the rate on your properties that have appreciated in value? They have as much right to your profits as they do to your losses right? where did I state I can easily afford monthly payments? Never said that… and rentals are paying 25% of what they were because of so much availablity and the abilty for folks to buy places rather than pay rent. Plus everyone wants the “deal” which I can’t blame them. again, not asking for free money, just to make that clear. Homeboken, do you work for a bank? Did they not make profits beyond expectations in 09? Did they not already get my tax monies to save their butts? “You would think in this situation I could call up the bank and say, hey can I lock in todays rate? you can continue to pay as normal and hope for the Daytona market to recover. What you seem to want is for the bank to refi your existing loan even the “V” in the LTV portion of you loan has dropped by X%. This would involve the bank taking a loss for your gain. Unless forced to a bank won’t purposefully enter into an agreement where they lose money and you make money. My advice, leaving out the ethics of it, would be start skipping payments. The bank may approve a short sale if you can bring them a buyer or they may modify the loan via Interest rate or principle write down. I find myself agreeing with JC actually; perhaps you need to go with option 3 that they described; a short sale after consulting with a specialist. That is probably a good compromise between walking out entirely vs paying for a property that lost half it’s value. On another note, I’m surprised you kept it for seven years+, it is one thing to keep your primary home, but for a third home (i.e. vacation / investment), I would have sold the moment I got down to ‘break even’ point (I assume you bought in 2003/2004 and saw some appreciation at first). JC is the second person to give me that advise. (other person about 4 months ago) I haven’t done it exactly for those reasons. It doesn’t seem ethic to purposely skip payments. So they are forcing people to be unethical. It is a sorry state we are in, that is for damn sure! It is clearly a business decision; the consequence of not paying is that you forfeit the house to the bank; that is the contract. Don’t let anyone try to steer this towards a morality discussion. Whatever you decide needs to be in your families best interest. It’s difficult for me to say that as I will likely take a tax hit when the next round of bank bailouts occurs if mortgage losses continue. You should contact a lawyer to fully understand your situation before deciding what to do. That said, please don’t deny responsibility for your initial over-priced purchase. Yes, they are forcing people to be unethical. They are only helping those that need it. So, skip a few payments and show you need the attention. If you feel bad about it later and nothing comes out of it then make a lump sum catch up payment. Foreclosure will hurt community pricing the most and your credit the most. If you have assets they MAY come after you but the chances of that are low. Even if they do it could be years out and you will negotiate a deal .50 on the $1.00. Short sale will hurt community pricing a bit and your credit a bit. You will be on the hook for payment at your income tax level for the $ forgiven. Make sure there is no recourse above and beyond the short sale deal. Regular sale will hurt community the least and your credit the least, but you will have to come to the closing with a large chunk of money. This will surely hurt your wallet. wait and hold…well, who knows. >It is 90% the banks fault. I’m not saying they should pay me for that. I’m just saying that everything is a result of their lack of judgement that I, the lowly customer, depended on. Who bears the responsibility of the aftermath effects of drug trafficking? The drug dealers or the drug users? I like to think its the later. What I will say in Underwater’s defense is that the mainstream media and the government has been very pro RE for the past 50+ yrs. Thus creating a culture where homeownership (and RE investments) is normal and a good thing. This basic premise is seldom challenged. Generations have been brain washed into oneway thinking. What constitutes homeownership? Do you really own your home when you have only a 3.5% stake? Lori – Getting back to Hoboken, do you have any data (anecdotal or otherwise) on what the average % down payment is for first time buyers in our town? FHA is the lion-share of the market nationally, but I am not sure that translates into similar stats for Hoboken. this was my issue exactly. sorry to hear the situation, you have some options, deal with it, but don’t deny you responsibility. You made an investment, it didnt work out, play the game by the rules set out and do what’s best for you. There are so few FHA approved buildings in Hoboken and spot approvals are very hard to obtain. My educated guess is less than 5% FHA and over 85% of buyers today put down 20%. You are not getting a condo in today’s market via a conventional loan with less than 20% down. It is true that here are only a handful of FHA approved buildings in Hoboken. But spot approvals are not that hard to obtain. They are quite easy to obtain as long as the building meets the spot-approval guidelines and you have a competent lender that specializes in FHA loans. I am purchasing my unit with a FHA spot approval (I put down more than 3.5% though) and it only took 30 days from contract to closing. My lender is Wells Fargo and they are really on the ball. Only problem is HUD is ending spot approvals effective 2/1/10. You need to have an active FHA case number by then or you can’t get one. As someone who works in lending (not mortgages) at a bank, it absolutely shocks me that after all that has gone wrong in the real estate sector, that the FHA is making low interest loans with only 3.5% down to people with questionable borrowing habits. How in the world will this not end badly for the taxpayers? The taxpayer is taking all of the downside with a very low return while the purchaser gets all of the upside. I assume that they are doing this to artificially put a floor on real estate values without coming right out and saying that they are preventing the market from determining the true price. Underwater, I think many people on this thread want to see you write that you are ignorant about real estate valuation. That you did zero due diligence prior to buying a vacation home in Daytona that you intended to rent out at a profit and eventually sell at a nice profit all the while deducting interest expenses from your taxes. That you purchased this $399 thousand asset despite your ignorance of the market. That due to your stupidity, you deserve the profit driven B of A to reduce your interest rate (why not reduce the face amount of the mortgage while you are at it) to a rate that is well below what they could earn on other potential loans to individuals or businesses. Otherwise, assume responsibility, admit that you are an educated adult who was chasing real estate fortunes, driving up real estate prices by making highly levered purchases, and that your aggressive bet on Florida real estate has gone all wrong. What to do now? If the rules allow you to walk away and you already have a place to live, do it. Many others are apparently doing it, so why not play the game the way it is designed? If I were in your exact position right now, I’d walk away from Daytona. Just like selling a stock that had fallen from $50/share to $2/share. Blow it out. It will have negative repercussions for that local real estate market, it will hurt B of A if they truly hold the underlying loan (most likely have securitized it and it is owned by investors throughout the world), and you won’t be able to borrow at market rates for 7 or 8 years (might be a good thing considering your track record). But the unit is rented / does this mean that underwater can continue collecting rent on the unit? BTW what happens in situations like that? Can the renter be evicted as well? It’s certainly no one’s job here to decide what is moral and immoral and seemingly correlate that to a smart financial decision the likes of which are made every day but the “experts” who are supposed to know what they are doing. Fact: Well over 125 banks failed in 2009. Moral or immoral? We trust these institutions with our money. Fact: Keeping an asset that has no chance of recovery in the near term is a waste of capitol..that’s all, nothing more. That’s how the financial world interprets it. You can sit around and take in the a** for the next 15 years or more under the guise of being “moral” or you can make a smart financial decision and get rid of a none performing asset. Let’s separate morality from smart financial decisions as two don’t and haven’t ever mixed. That’s the way the tax code is set up and the corporate world as well. On other news..Lori mind if I give you a PR 3 editorial link back to this article? It’s a beauty!